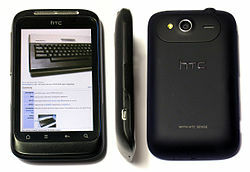 The HTC Wildfire S is a smartphone developed by the HTC Corporation. The model was announced on 15 February 2011 at the Mobile World Congress and released in Europe three months later. Android 2.3.3 Gingerbread (upgradable to 2.3.5) with HTC Sense 2.1. Non-official CyanogenMod ports of Android 4.0 Ice Cream Sandwich, 4.1 Jelly Bean, and 4.4.2 KitKat exist. 3.2" 65,536 color TFT LCD HVGA (320 × 480) at 180 pixels per inch. HTC Wildfire S is considered to be an update of 2010's HTC Wildfire, having a newer, 600 MHz processor by Qualcomm, support for the faster Bluetooth 3.0 specification, and a screen with double the resolution (HVGA, updated from QVGA). The Wildfire S includes a TFT LCD capacitive touchscreen and a 5-megapixel camera. Unlike its predecessor, the Wildfire S has no trackball or trackpad. The device runs on Android 2.3.5 Gingerbread, and comes with an upgrade to HTC's Sense UI. However, by rooting, the user is able to install CyanogenMod versions of Android 4.0 and 4.1. In the United Kingdom, the Wildfire S is available from several carriers, including 3 (Hutchison 3G), Vodafone, Orange, Tesco Mobile, T-Mobile and O2. In the United States, it is available through carriers US Cellular, T-Mobile, Virgin Mobile USA and MetroPCS; in Canada through Bell Canada and Virgin Mobile Canada; in Australia through Telstra; in New Zealand through Telecom New Zealand; and in India it is available in open market. In Ireland, it is available through networks Meteor, eMobile, Vodafone, O2, 3 (Hutchison 3G), and Tesco Mobile. In Bulgaria, it is available through networks Mobiltel, GLOBUL and Vivacom. In Pakistan, it is available throughout in market and uses networks are Telenor, Ufone, Jazz and Zong. ^ a b c "HTC Wildfire S Product Overview". HTC. 2011. Archived from the original on 2011-10-18. Retrieved 2018-11-06. ^ "HTC Incredible S, Desire S and Wildfire S showcased at MWC". Mobilegyaan.com. 2011-02-18. Retrieved 2012-10-29. ^ "Support: Software update: HTC Wildfire S". T-Mobile Support. Archived from the original on 17 September 2012. Retrieved 29 October 2012. ^ "Android 4.0 ICS for HTC Wildfire S! (LeWa OS + CM9)". HTC Wildfire S Blog. 2012-06-13. Archived from the original on 2014-12-31. Retrieved 2012-10-29. ^ "Virgin Mobile USA". Virginmobileusa.marketwire.com. Archived from the original on 2 April 2012. Retrieved 29 October 2012.